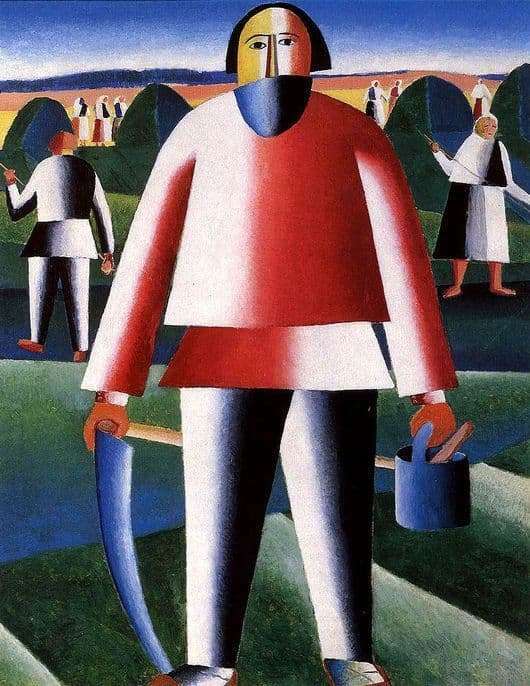 Kazimir Severinovich Malevich painted the picture “On a haymaking” in 1929. And now it is stored in the State Tretyakov Gallery. And it was created in the genre of Suprematism. In his paintings can be traced such trends as cubism and futurism, as well as abstract art. The essence of this picture is peace, which is based on geometric shapes. Despite the fact that K. Malevich was very famous, he is still one of the most mysterious artists. And this is because of the creativity created by him, art. He said that an entity does not have anything a society with the objective world – it is faceless, pointless, it can be expressed only with the help of sensations. And Suprematism is that new, non-objective system of relations of elements, expressed through sensations. The painting “On a Hayfield” is an almost cubically constructed picture. There is nothing superfluous on it. The whole picture is taken by a full-length image of a man haying, in one hand he holds a litovka, and in the other a small bucket with a tool. He is dressed in work clothes: a red shirt and dark pants. A part of his face is covered with a handkerchief. It is evident that this peasant is physically strong. He stands on the light green grass and carefully looks ahead, they seem to have dropped all the life. Other workers work behind him: a man and a woman in gray clothes, they are busy working. In the distance, ready-made green haystacks with blue hues can be seen. Soon this grass will dry up and become hay. The already plowed yellow-brown fields can be seen very far. In the background you can see a small forest. The field illuminates the bright blue sky, almost cloudless. At the time of harvesting hay, all adversities are forgotten, the weather is sunny and warm, the period of heavy rain has passed, all the conditions for fruitful work are there.